Tymvaul is a Nord necromancer who until recently lived in the Skaal Village. He recently fell down the well behind his father's house, and now resides in the caverns of Rimhull. 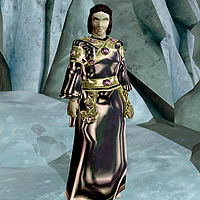 Tymvaul wears the unique Mantle of Woe robe. Aside from his natural resistance to shock, immunity to frost, ability to shield himself, and a natural frost damage spell, he knows: Summon Skeletal Minion, Flay Spirit [Ranged], and Force Bolt. Voice: "The forces of darkness are mine to command! All shall bow from the terrible power of Tymvaul the Dark!" "Intruder! Who dares venture so deeply into the halls of Rimhull?! The Mantle of Woe is mine do you hear? I have claimed the robe and its power!" "Thank you again for helping my family. Tell my father that I will return one day, and make him proud." "Behold the vestments I now wear! When I read the old stories I had to learn the truth. Could it be that an item of such grand magicka lie so close at hand, in the caves beneath my very village? I could contain my eagerness no longer, and jumped into the well. I braved Rimhull's dangers, and at last my efforts were rewarded. Soon the dead shall walk, and Tymvaul the Dark shall lead them!" "The Mantle of Woe is now yours, %PCName. I urge you to destroy the robe, lest its dark power take hold over you as it did me." Apparently his dialogue answers seem to be kind of wrong: he's supposed to be part of the Skaal Village but when asked about Korst Wind-Eye, the village's shaman, he will answer he doesn't know him. He also seem to just 'vaguely' know who Tharsten Heart-Fang (the Skaal's leader) is and will talk about the Skaal as if he's not part of them (but this could be acceptable since he apparently left them). This page was last modified on 23 November 2018, at 06:29.